7 points, three behind leaders Namibia who they will meet in the decider next weekend. The winner of the tie will book a slot for next year’s World Cup in Japan while the loser will go for the repacharge tournament. Debutant Willy Ambaka sunk two tries as Kenya picked the massive win and a bonus point for the first time this season. Willy Ambaka broke the deadlock after powering his way through the Tunisian defense after a little pretty offload from Isaac Adimo. Skipper Davis Chenge then dotted down Kenya’s second try from the scrum with Darwin Mukidza booting home both conversions. Kenya extended the lead further, Andrew Chogo dotting down his first try of the Gold Cup campaign and Mukidza converting. Jacob Ojee’s super speed extended Kenya’s lead further, the KCB man wheeling away from deep in the Kenyan half to dot down and Mukidza converting for a 28-0 lead. Elkeans Musonye extended the party for Kenya, a quickly started line out after the Tunisians failed to hold on to a kick finding the Strathmore Leos man who quickly side stepped a late challenge and crossed over. Mukidza stepped up and added the twos as Kenya went 35-0 up. Mukidza then had a try of his own after turning over possession but he could not convert from wide, the score going to 40-0 at half time. Martin Owilah then added Kenya’s seventh try of the game right after the restart, picking up the ball and racing through to dot down. Substitute Peter Karia added on to the haul with the eighth try of the game after a quick turn off his marker. 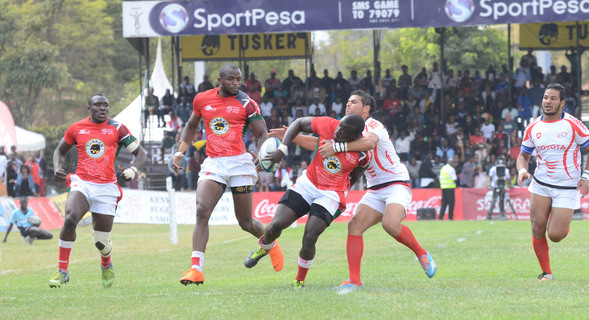 Mohammed Omondi dotted down and converted his own try before Tony Onyango made it 10 tries for Kenya in style racing away on the right after the ball was spread well to his side. Ambaka then completed his brace late on dotting down on the left to mark his competitive debut for the team with a fine performance.